Crisp, modern silhouettes provide a look that's undeniably trendy and geared towards Millennials with the new Great Rooms Dining Collection by Universal. With three finish options, four table options, and three chair options you can truly create your own look within this dining collection. Hints of traditional design details are spotted throughout the pieces while fresh finishes modernize this collection. All four tables feature a slim design. In today's homes, we're seeing a need for thinner tables to fit dining storage and still have room to spare for getting in and out of the dining chairs. The Cheslsea Table, the Tribeca Leg Table, and the Gathering Table feature additional leaves to extend the table during holidays and family gatherings or to fill those larger dining rooms in today's homes! 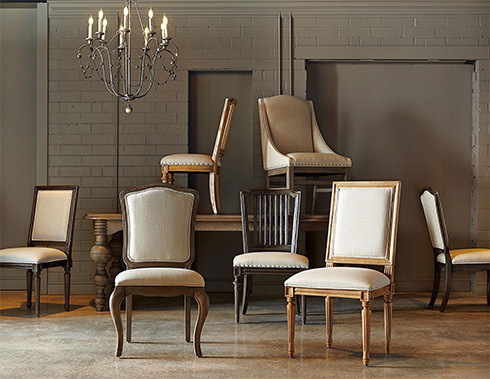 Whether you like to mix and match chairs or create a uniform look, each of the chair options in the Great Rooms Collection offers a distinct look that's ever-so-popular. The Urban Arm Chairs are a look we're used to seeing - and for good reason! These sloping arms are a great alternative so that the 'arm' isn't always in the way. The all over upholstery breaks up the wood on wood and anchors the ends of the table. Three distinctly different looks, the Cafe Side Chair, the Bergere Side Chair, and the Paris Side Chair all offer a comfortable upholstered seat. Don't forget about dining storage! This collection offers three looks for dining storage options, too. The Great Rooms Rack has been a popular option from this collection for a few years, but now it's available in finishes to match this dining collection. This is the perfect way to display your prized serving pieces or showcase some great accessorizing. Sometimes, it's just all about the wine! 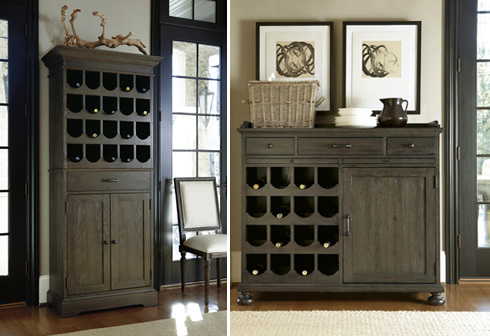 The two other storage options for this dining collection highlight your wine collection and offer a safe place to store a good amount of bottles. The Tall Wine Cabinet features wine bottle storage up top and drawer and door storage below. Two of these flanking a window in a dining room create an amazing look! The final option is the Small Wine Cabinet which combines wine and closed storage and offers a surface space at the top. 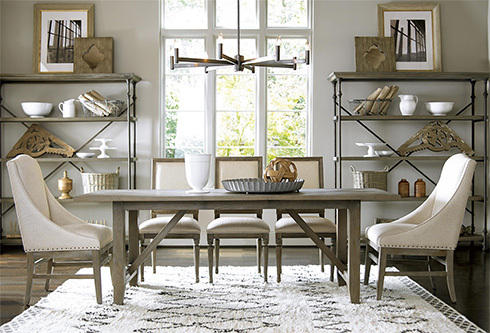 To view the Great Rooms Collection and other inspiring dining rooms and home settings, visit Belfort Furniture in Dulles, Virginia. With four unique showrooms in one convenient location, make sure you visit both sides of the street to see all that Belfort has to show! Need design help? Fill out the easy online form for Design Help and we'll offer suggestions and answers to your design questions!